Thanks to the faculty who participated in making Dr. Reimers' visit to the University of Louisville a success! Ideas to Action invites you to join us for one or both of the upcoming interactive sessions with Dr. Reimers. You will have the opportunity to expand and deepen your teaching strategies to promote critical thinking in your classroom or teaching context. Dr. Tine Reimers serves as Special Assistant to the Provost for Faculty Development at the University at Albany. 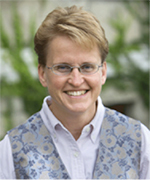 Dr. Reimers obtained her PhD from the University of North Carolina—Chapel Hill in Comparative Literature, and has taught Humanities, Writing and Rhetoric, World Literature, French, and Philosophy in a variety of settings, from large "Research I" institutions, to small colleges, to universities in France and Japan. She has facilitated critical thinking workshops all over the nation and for fifteen years has been working in the area of teaching and course design to engage students in critical thinking. She has worked with faculty from all disciplines, presenting teaching, leadership and professional development programs. Want to know more about Reimers' approach to critical thinking? Here's her critical thinking bibliography [PDF] and her taxonomy of critical thinking theories [PDF]. Teaching Critical Thinking: Are We Really Doing It? Check-in and continental breakfast will begin promptly at 8:45 a.m.
Are we really successful at teaching critical thinking? In this interactive workshop we examine common university teaching practices, assumptions about critical thinking, and student learning habits to see how successful we’ve been in making critical thinking a learning goal. You will experience practical, immediately usable notions of critical thinking, which will help make visible what is often left invisible in the work of the university teacher, develop a working definition of critical thinking and apply this definition to your own classes. You will experience a sequence of increasingly complex learning activities designed to clarify the challenge of teaching critical thinking. By the end of the workshop, you will come away with a clear understanding of the process of critical thinking and several strategies for teaching it. Since this workshop is about doing critical thinking, you will not just hear about strategies, but also experience some approaches to teaching critical thinking. How do we move from talking about critical thinking to doing it in the classroom? The answer lies in a "data-intensive" instructional approach, which transforms mundane textbook content into student learning activities that foster an "attitude of inquiry." This session will demonstrate ways to problematize the material of a discipline so as to invite students into authentic engagement with significant discipline-specific questions. Participants will experience and analyze critical thinking tasks that place students into activities common among university faculty: inquiry, discovery, interpretation, invention, scholarship, and application of research. Each of these tasks illustrates different ways in which the common textbook material of academic study and research—the ordinary "data" of a discipline—can be transformed into inquiries that turn students into analysts, questioners, judges, decision-makers, and research designers. Session participants will be immersed in hands-on activities, and will begin developing their own critical thinking experiences for students.